At Gra-Mac Irrigation, we know a thing or two about irrigation systems in North Carolina. After all, we’ve been experts in the field since 1955. That’s why when any of our clients have questions, we immediately have answers. Over the years, we’ve had many customers wonder what type of system they should use to grow plump and delicious fruit. While there are many options to choose from, we almost always recommend drip irrigation. In this post, we’ll give you a few reasons why this is. If you have any questions or would like to know more about our irrigation equipment, don’t hesitate to contact us today. Just like the fruit that you’re looking to grow, weeds also love soil, sunlight, and of course, water. Therefore, they almost always pop up to compete with your fruits or plants. This can be frustrating and obnoxious. By using drip irrigation, you’ll eliminate basically all of them. With control over where the water goes, you’ll be minimizing the amount that the weeds get which will give them a tough time establishing a strong base of which they can grow. As stated above, one of the biggest benefits of choosing a drip irrigation system is your ability to choose where the water is going. With other irrigation systems, the water is usually sprayed across a wide area. This means that other plants, such as those pesky weeds, will be able to use this water to thrive and the plants that your hoping to grow fruit from might not be getting the amount of water that they need. With drip irrigation, all of this is taken out of the equation. You’ll be able to water exactly where and what you want to, i.e. your fruit plants. Another benefit to this is that you’ll be able to conserve the water that you’re using instead of excessively spraying it everywhere. 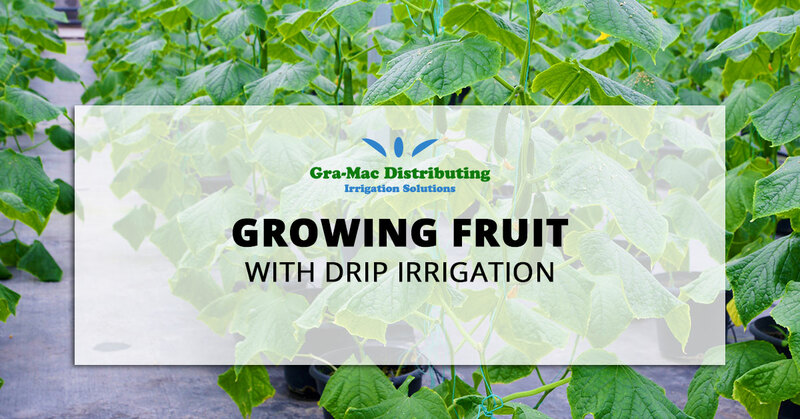 By having the water go straight to the source (the root of your plants) instead of on the fruit, you’re eliminating the chance that mold and mildew will grow. As any fruit grower will attest, this is the most obnoxious problem to encounter, and not to mention costly. It can be rather difficult to have anybody buy your fruit with it has mold or mildew on, so most of the fruit that you’ve worked so hard on growing will basically go right into the waste bin. Although we do specialize in subsurface drip irrigation, we’re also experts on every other irrigation system that you can use in North Carolina, no matter if it’s for a large field, or just your own personal garden. We are a full-service irrigation equipment supplier as well as irrigation installation company, and our sales and service employees have over 75 years of combined experience about all things irrigation.